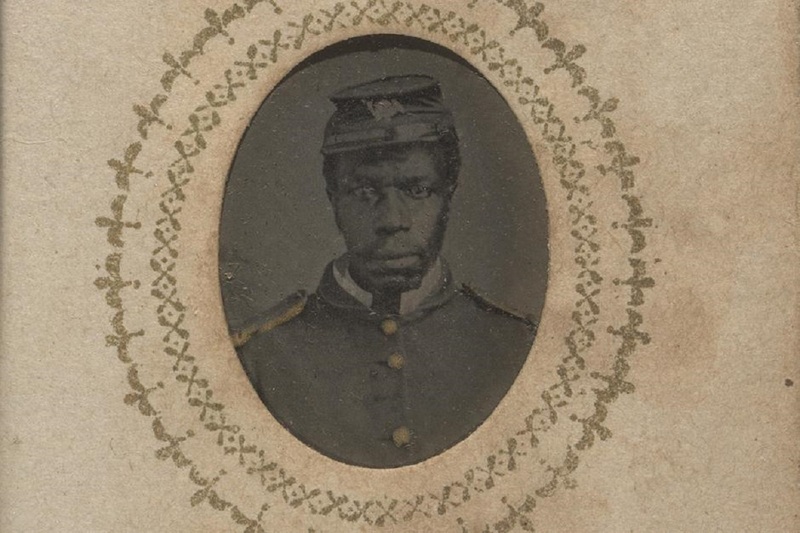 This miniature album exhibits the uneasy yet special bonds between black soldiers and white officers in the United States Colored Troops (USCT) during the Civil War. When soldiers in Capt. William A. Prickett’s unit, G Company, 25th USCT, nursed him through a life-threatening illness in 1864, he created this keepsake out of affection and respect for his men. More than 179,000 African Americans served in the USCT. Another 20,000 to 30,000 served in the Union Navy. Their military service helped nearly 4 million enslaved people achieve freedom and citizenship, as well as the right to vote for African American men. The Army Reorganization Act of 1866 made African Americans a permanent part of the military. Many African American soldiers, such as the ones in Capt. Prickett’s album, made identification tags not only to identify themselves should they be killed, but also to show pride in their service to the cause for freedom. The Mobile Stories app is a complement to your Museum visit and a way to discover some of the many stories found in our collection. The app features highlighted objects from the collection, multimedia and augmented reality features to enhance your Museum experience, and new stories exploring our inaugural exhibitions.